Oscar nominated actor Bradley Cooper (“American Sniper”) has made an unusual choice for his directorial debut. Warner Bros had been planning to remake “A Star is Born” for years (there are versions from 1937, 1954, 1976). This one was originally conceived as a vehicle directed by Clint Eastwood and staring Beyoncé. Cooper is almost as impressive behind the camera, he is in front of one. This is certainly his best performance to date, as the once great singer whose career is winding down. Casting Lady Gaga in the leading role was both risky and genius, a choice in which Cooper gets all the credit. Even if the movie was mediocre, the Grammy award winning superstar’s fans would still turn out in droves to see it. As it turns out though, the film is solid, mostly in expected ways. Once a celebrated alternative country artist, Jackson Maine (Cooper) is losing his hearing to age and his soul to alcohol. The leather faced performer, badly needing to feed his addictions, lands in a drag bar where the only woman allowed on stage happens to be singing live. Ally (Gaga) is a high-class NYC waitress by day, and a songwriter, afraid to sing her own songs, by night. The two flirt, fall in love, then quicker than she can process, she finds herself onstage in front of thousands. Her star begins to rise, while his fades. Jackson’s addiction and jealously won’t let him embrace the nearly ideal life he has within reach. “Shallow” is the duet from the trailer, the heart of the film, and the crowning moment where Gaga ignites the sparks for the first time. Overly enthusiastic reviews for the film indicate a definite crowd-pleaser if not a moderate awards contender. All the talk about hairs standing up on your arm or the documented goosebumps, the first time she takes stage in the film, is no oversell. “Shallow” is the duet from the trailer, the heart of the film, and the crowning moment where Gaga ignites the sparks for the first time. While her popularity in the music world makes Lady Gaga the film’s selling point, Cooper’s performance is among this year’s best. The deep raspy voice he’s uses sounds like he took voice lessons from Sam Elliot (“The Hero”), making both roles more convincing. After the first 45 minutes of the film, there is a massive tonal change, along with Ally’s hair color. This change in tone nearly ruins the praise to Gaga for disappearing inside the role of Ally. I was quite disappointed in some of the songs (“Heal Me” being one of the worst), especially when Ally transitions closer toward a more recognizable Gaga persona. Despite being over two hours long, the film rushes Ally’s rise to fame (and Jackson’s downfall). She sheds the nervous personality she has in the beginning too quickly. Fortunately for Director Cooper and Eric Roth (“The Insider”) this story avoids the typical musician drama stereotypes like physical abuse and infidelity. “A Star is Born” is far from perfect, although it strikes me as the “Shape of Water” / “Three Billboards” type that will becomes this year’s most agreeable, middle ground choice. I was hoping for a bit more delicacy and restraint here like we saw in “Crazy Heart,” but Cooper aims for big and bold throughout. 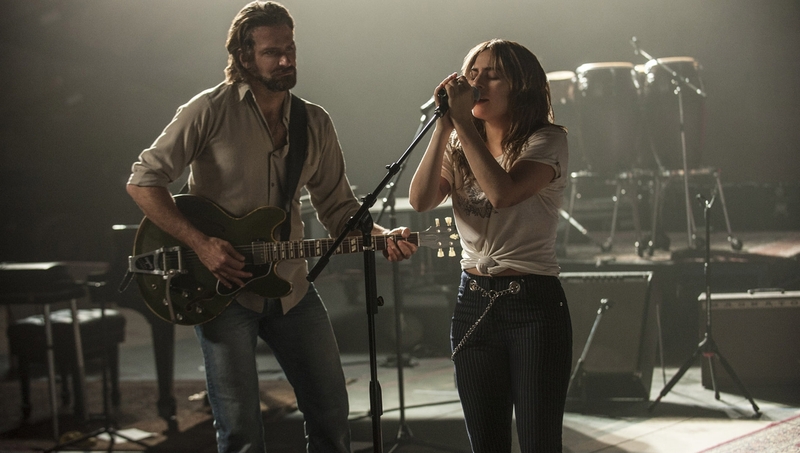 Bradley Cooper’s directorial debut and Lady Gaga’s cinematic debut hits a lot of great notes, but it’s far from polished or perfect.